Those who watched this space during election season know I was critical of the church's propensity to become preoccupied with issues and activities that are not central to its chief mission and calling. I have recently been contemplating a picture which has been growing in my thoughts, and which I have attempted to construct above. Keeping in mind that there is no such thing as a "perfect analogy", the key thoughts I have tried to represent are as follows. 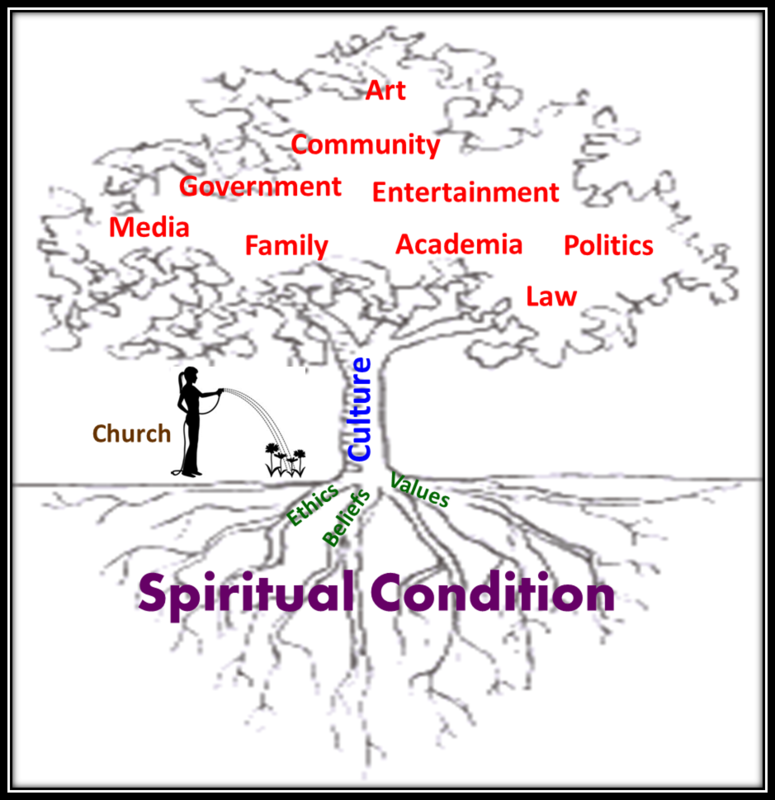 The public culture is only as healthy as its overall spiritual condition allows. The culture is fed by its dominant beliefs, values and ethics. Our public institutions are the most visible manifestations of the culture. They are often dazzling and give the illusion of permanence, but are in fact quite brittle and change with the weather. The church’s primary public responsibility is to exalt Christ; to clearly, lovingly and boldly represent Christ in word and deed; and to make and grow disciples of Christ. When healthy, the church nourishes the culture by faithfully performing this mission. When unhealthy, the church merely reflects the dominant culture, providing limited nourishment. When unfocused, the church gets caught up in trying to recolor the leaves, rather than addressing the underlying spiritual condition by remaining faithful to our Lord and concentrating on our primary mission. This is intended to provoke thought and discussion, so please ... think and discuss! UPDATE: Please also visit Petra's observations on this post over at TGS as she also wrestles with this issue. Let me just add by way of clarification: I don't believe the church's chief mission is to change the public culture. The point of the above is that much of the church gets carried away with chasing this idea ("coloring the leaves"). Still, I do believe that the culture may be changed for the good as a natural by-product of the church carrying out its primary purpose, as stated above: to exalt, faithfully represent & make/grow disciples of Christ. After all, when there is more salt, and that salt has not lost its saltiness, it cannot fail to flavor the earth (Matthew 5:13). 1. I think I might need a definition of "culture." If we use the term to delineate those outside the Church (universal), and therefore refer to unbelievers, I'm not sure that culture CAN be nourished -- even by a healthy church. In that case, culture is "dead in the trespasses and sins." No amount of watering, etc. can help a tree in that condition unless God is pleased to make it "alive together with Christ" (Ephesians 2:1-6). 2. I do agree that there is a great deal to much "leaf coloring" going on today. Very good point. One thing I would add is that issues such as media, art, etc. are excellent ways in which to engage our culture. Of course, as Anonymous posted, one way to address cultural issues is to employ reason (i.e., natural law); however, this kind of defense never brings the issue full-circle to the question of Christ, and THAT, as you said in your article, is a primary purpose of the Church. We deny the power of our faith if we fail to use these issues to uncover the underlying spiritual condition of our culture (Acts 17:23). In the end we "preach Christ and Him crucified. Reason makes moral pharisees but mighty poor disciples. I generally agree with your points, though I do think the public culture can be nourished by the church, insofar as we are "the salt of the earth" as well as "the light of the world". The point of the article is that we do this best and properly by concerning ourselves primarily with the Master's tasks. For one thing, if there are more believers then there is more salt in the culture. Second, if the salt has not lost its saltiness, it is more effective. Thanks for the excellent input. I like the tree you depict. One of us is reading the others mail because I've had these same thoughts and concerns about where America is today..... and where we seem to be heading. Perhaps due to the technology we Americans love and are famous for, the world seems to be moving much faster than our spiritual maturity. I came to Christ because of a slow and gradual awareness that the people I admired and respected most had something in common.......they loved Christ. They had something that stood out from the crowd, something easy to notice, something I wanted to get. In other words, I came to Christ by a few people who "represented Christ in word and deed," that you mention in your article. They were the "salt" you talked about.......and it's that salt, that brought me to Christ. No church or preaching ever came close to bringing me to Christ. It was 3 people who "walked the walk," who represented Christ in word and deed. I'm ashamed to admit how slow my spiritual growth has been over the years. I can look back and clearly see where the Lord has used me in my life to accomplish certain things He wanted to do, but I cannot say that I was or am now the salt it takes to "make and grow disciples of Christ." I think believers as individuals, and collectively believers as the church, put the cart before the horse in winning souls. The individual and the church must be well grounded in Christ to become ambassadors for Christ. Otherwise we become a stumbling block to others and none of us want to do that. I'm increasingly convinced that to change the world, our country, or the heart of one person, I have to start with myself. Until I can change myself and become the salt that you talk about, I'm still just a critic like most people and not part of what the Lord wants and expects from me. You got me thinking hard.....thanks for leaving the lights on (as Tom Burdette would say)!!!! Very helpful and challenging. But in truth we can 'save' nothing in the real sense by ourselves but as you make clear by exalting Christ and making disciples God can and does use us to influence so many different things. The being 'salt and light' is so important, our witness in every area of life must reflect Christ and in this way we can influence so much. The use of Jesus by this comment in itself implies we can make a difference, indeed dare I say it - expects us to make a difference. Your headline is what caught my attention - I wondered if you were going post-mil reconstructionist. Your article is spot-on, however! The entire article is a well written and biblically sound summary of the interaction between the church and the culture. This is a terrific illustration that, I believe, documents the truth. In any situation when there is a problem one must get to the root of the issue to completely solve it. In my former career as a nurse, one of the first things we learned in school was that symptoms are a result of a specific disease or root cause, and treating symptoms simply doesn't solve the problem. In fact, as I type, my husband is suffering from a bad cold and asking over and over what he can take to get rid of it. And over and over, my answer is that the cold remedies only temporarily alleviate the discomfort of the virus but will not cure the cold. It's as if our country, and indeed our world, is suffering form the worst viral infection there is, and the symptoms that are evident are unrighteousness of all kinds. But, unlike the common cold, there is a cure available for the sin virus--Jesus. But, as in the illustration it's got to start at the root of the problem, the spiritual condition. The church trying to "recolor the leaves" is just as ineffective as trying to cure a cold with Tylenol and an antihistamine. The "church" CAN nourish the culture, but only if the members are truly living a life of Christ. As the saying goes, actions speak louder than words. I cannot tell you how many times I have been preached at by "Christians" who do not live what they preach. How is the world supposed to take the church seriously when much of what they see does not reflect what they hear? Each individual Christian must do what they can in their own lives to help change our overall culture. Change happens one person at at time and each time we as Christians interact with another person, we have the opportunity to change the life and perspective of that person. My 15 year old daughter Katie is a perfect example. AFter 7 years of homeschooling she entered public school last year. I was a bit worried about her social transition as she is a bit "quirky" and so unlike modern teens. She is strong in her faith however and strong is who is she. When the boys around her kept swearing constantly she would simply ask them to stop. She did not get upset, or show distain or anger, she just put forth a simple request. At first, they took it as a challenge and did everything they could to get her to swear as well or at least embarrass or upset her. When they were unsuccessful it led to conversations about why she didn't swear. (She shocked one boy when she explained that it wasn't the words themselves she wouldn't use, but the context. She then proceeded to tell him all about asses (as in donkeys, of which she knows a lot) and he couldn't believe the word came out of her mouth. A year later however, most of the boys now make a point of not only not swearing around her, but protecting her from others with foul mouths as well. She is slowly makng a difference to the behavior, and yes, culture, of the those around her. In the year and a half she has been in public school, she has never let the boys behavior upset her (even when they tried), and the very fact that no matter how they treated her, she was kind, bubbly, and generous in return, is what has earned her their friendship and respect. I think that in today's culture of instant gratification, the church itself has become impatient. Your analogy of coloring the leaves is a good one. Christians are no longer content to slowly change our culture from the roots up, but want instant change and think a little color on the leaves is the solution. If my daughter had preached at the boys and constantly told them how sinful they were, they would have ignored her, but by simply living her beliefs, they slowly learned to respect her and change their own behavior as well. Our culture did not degrade overnight, nor will it restore itself overnight. If the church truly wishes to change the worldly culture, then it must actually interact with the world. I know many Christians whose children go to Christian schools, Christian youth groups, and are only allowed to associate with other Christians. The parents will only do business with Christian businesses, and will only be friends with other Christians. These same people are the most vocal about condemning our current culture, yet won't interact with the very people they wish to change. If we as Christians, behave in a Christlike manner, it is our actions that will be noticed first. Non Christians question WHY we bahave in a such a way and THAT is what leads to opportunity to tell them about Jesus. If you don't interact with non-Christians on a regular basis, how are you supposed to spread the word of Christ? Even then, if we talk first, without showing that we are living our beliefs, they are just words and are easy to ignore. If all we do is rant and rave at the media, acedemia, government etc. and throw Bible verses at them, it is meaningless without action. Dear, Jailer, thank you for sharing your thoughts in response to my thoughts and for the link-back. I respect you and thank God for you because it is evident that you, as part of the church, flavor (salt) each part of your journey as you remain rooted in Him. Hence, I agree that the healthy church can and will influence culture. It just doesn't always do so positively, leaving us (or other believers) to make bricks without straw or to write letters of encouragement while shackled or imprisoned, because culture rebels against God's life-giving, Christ-exalting nourishment. Furthermore, I agree with you that "the church’s primary public responsibility is to exalt Christ; to clearly, lovingly and boldly represent Christ in word and deed; and to make and grow disciples of Christ." My knee-jerk reaction was mostly in regard to: "When healthy, the church nourishes the culture by faithfully performing this mission. When unhealthy, the church merely reflects the dominant culture, providing limited nourishment." I believe that the healthy church must nourish and encourage its own to equip them to brave thorny thickets and wolves, to save and to change the lost, regardless of whether the culture agrees, cooperates or throws rotten eggs. When healthy, the church exalts and glorifies God! The healthy church is Christ who came to save the lost... and still does. Christ saved, loved, and fed Peter so that Peter would be willing to feed His sheep and able to endure the gall of his culture, which had neither appetite for His nourishment nor love for His sheep. Besides, I know of very unhealthy churches that do not reflect the dominant culture at all but only their limited, sickly and prejudiced selves. The awesome thing I gathered from your deployment to Afghanistan, was that God used you to find and nourish His lost sheep in spite of the cultural or moral indifference or dangers that kept us on our knees on your behalf. Culture does not always respond favorably, and when lost sheep are found, saved, and changed they suddenly find themselves at odds with the world and with their culture, which refuses to be fed. Saved sheep have their eyes opened and see what is wrong with their culture. A saved sheep feels suddenly alienated and alone and then some... (ask me how I know) and must be fed with better food in the nourishing and nurturing warmth of His sheepfold! But to what end? To nourish the culture it has been saved out of? To give dogs what is precious or to throw pearls to the swine? Sheep must be nourished by the bread of heaven, not to grow fat, but to grow in faith. And here, as I continue to think, emerges my beef, I think. Our church feeds and nourishes, nourishes and feeds... and here we are - am I - one fat sheep of many a fat sheep - one proud sheep of many a proud sheep because I've been so thoroughly nourished (taught). The fat sheep notice who's missing from the pews, but they don't notice what's missing! They notice the empty chairs as they discuss the importance of church attendance and draw pretty diagrams of how to best disciple others. And they, we, I forget that we are not nourished to become fat, proud sheep who know it all so that we can sit around and raise "How to make better bricks without straw" and "Effective leaf painting" committees because, during all our munching, we've forgotten that God is in charge and that His plan isn't always comfy. Given Grace has summed it up very nicely: "Reason makes moral pharisees but mighty poor disciples." So, Jailer, thank you for your love and patience and for allowing me to share my thoughts and exaggerations freely. I'm not done thinking yet and by the grace of God I will understand this church thing more, maybe even grow to like it more. Hopefully I will grow in faith and find others who are done growing fat and ready to brave the briers. I know they're out there somewhere. Until then be blessed my brother in Christ! Awesome illustration. I have made copies for myself and others. I hope to enlarge the drawing and plaque it as a reminder to myself of what is important during the life path that I find myself on. My former church is losing members rapidly as Christ is no longer being exalted and the pure truth of the Bible is no longer being taught. It's sad to see this happen.